Soncoya is a native of Central America. It is quite common in coastal lowlands from southern Mexico to Panama, Colombia and Venezuela. It is grown there on home garden scale. The fruits are also available for sale in local markets. Soncoya has also been introduced into the Philippines and a few other Asian countries. 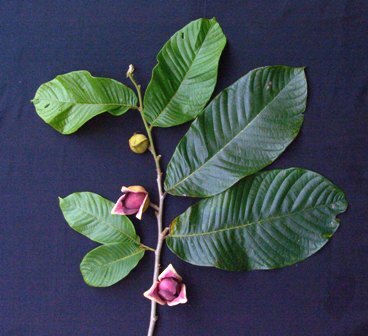 A small to medium deciduous tree, 6-10 m high: trunk short, 45 cm in dia, branching spreading, rusty woolly when young. 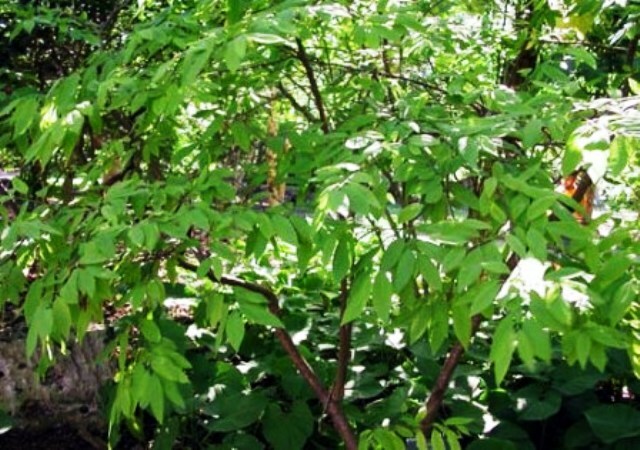 Leaves are alternate, short-petioled, undulate, oblong-elliptic or oblong-lanceolate to oblongobovate, 20-30 cm long and 10-14 cm wide, acuminate at the apex, brown-hairy on both surfaces and with prominent veins beneath. 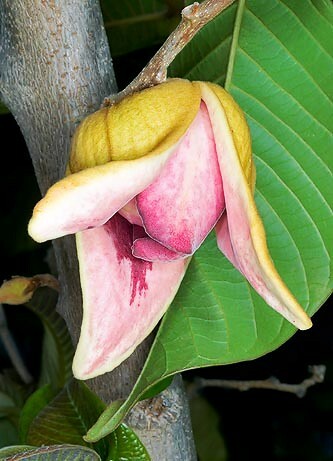 Flowers, which emerge with the new leaves, strongly fragrant, solitary, fleshy, large, conical, usually enclosed at first by a pair of bracts; held at the base by a rusty-hairy, 3 parted calyx; outer petals 3, very thick, brown hairy outside, yellowish and purple mottled within, and 3 smaller, inner petals also 3, relatively thinner, creamy white outside, purple inside. 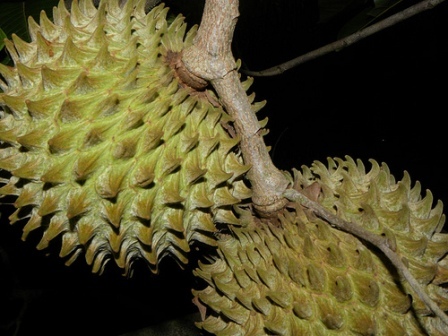 Fruit, thick stalked, ovoid or nearly round, 15-20 cm wide, set with hard, somewhat 4-sided, conical protuberances, each tipped with a curved hook, and is coated overall with a brown felt; pulp agreeably aromatic, aroma resembling somewhat of mango, abundant, yellow or orange, soft, fibrous, taste good. Seeds numerous, obovate, 2.5-3 cm long, dark-brown, each is enclosed in a thin, closefitting membrane, fruit carpels easily separable at maturity. The pulp is eaten raw or is strained for juice in Colombia. It is also made into a beverage. The juice is given as a remedy for jaundice Mexico. The bark decoction is effective against dysentery and a tea of the inner bark is administered in cases of edema. The seed extract destroys fleas. Soncoya is a tropical fruit and therefore requires a hot and humid climate. It has not been noticed occurring above 1200 m altitude. This fruit is easily propagated by seed. 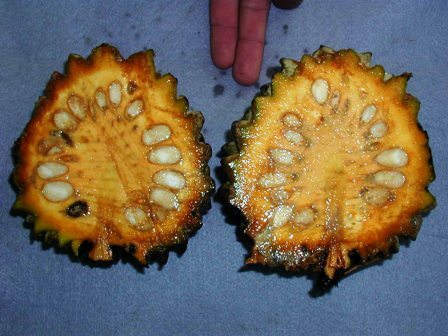 The The surface of the fruit has There are hook like projections on the surface of soncaya fruits. These are quite hard. Because of these, people do not find this fruit very convenient to handle. It is probably one reason because of which this fruit has not able to become popular as an orchard fruit.